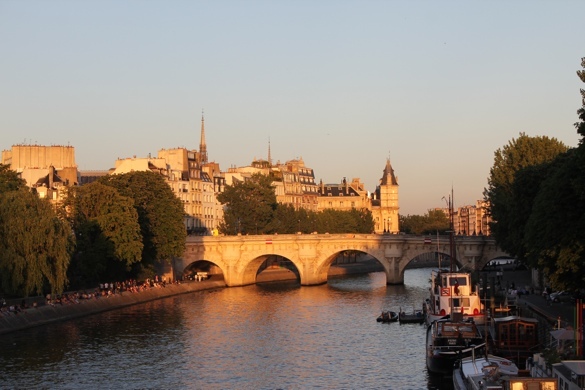 The months of researching where to eat in Paris had resulted in a long list of restaurants to try. What I hadn’t realised was that our hotel was in a fabulous position for many of these restaurants. In the streets nearby, Japanese and Chinese restaurants flourished, and gauging by the queues that formed outside many of them, there are some very good ones. At the end of the street was the restaurant, Les Bistronomes. After our fabulous day exploring the King’s private apartments at Versailles and Marie Antoinette’s Playground and Hamlet, this cozy little bistro was a perfect choice for dinner. Small and intimate, we were immediately made welcome by one of the owners, Sylvain, who quickly found our table marked with a small blackboard with our name on it. A novel idea for reservations. 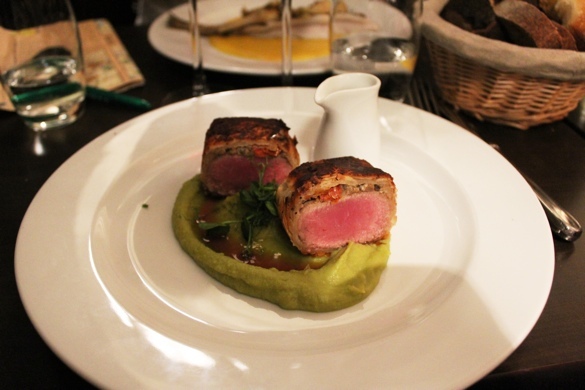 When I’m in Paris, I like to try different terrines and pâtés. I was not disappointed here. 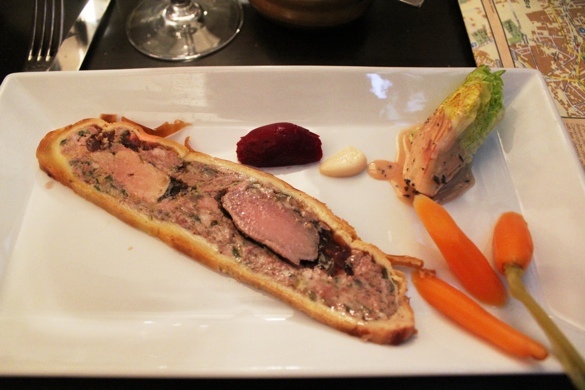 The pâté, wrapped in a pastry crust, had a knob of foie gras and a slice of duck breast in it. It was served with tasty pickled vegetables. Fabulous. 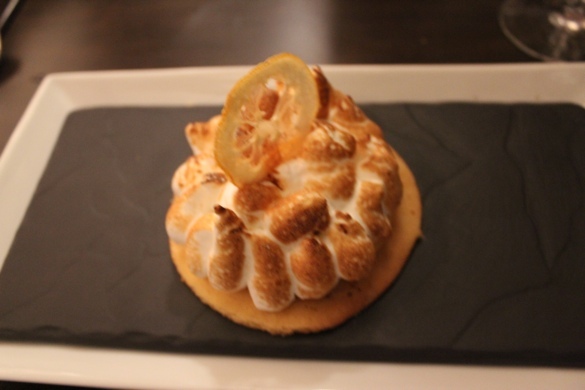 How could I resist the lemon meringue tart! Another popular restaurant, La Regelade Saint- Honoré was just around the corner in Rue Saint- Honoré. Unfortunately we could not get a table but I’m mentioning it so that you can add it to your list! 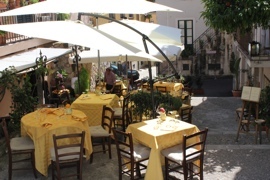 A bit further from the hotel, but still in the 1er Arr, is the restaurant ‘Spring‘. I was so excited when the hotel emailed me to say that they had been successful in making a reservation. This was no mean feat. 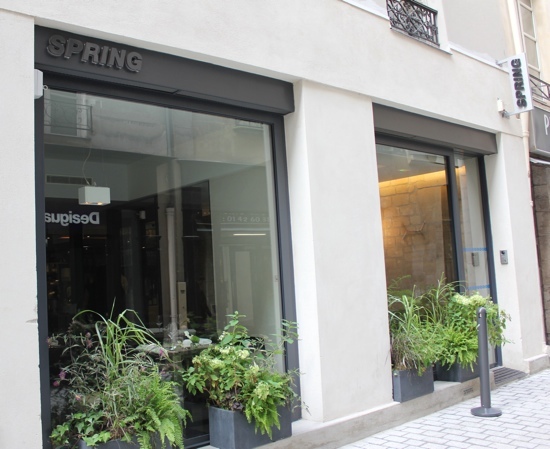 Spring is one of the hardest restaurants in Paris to get into at the moment. 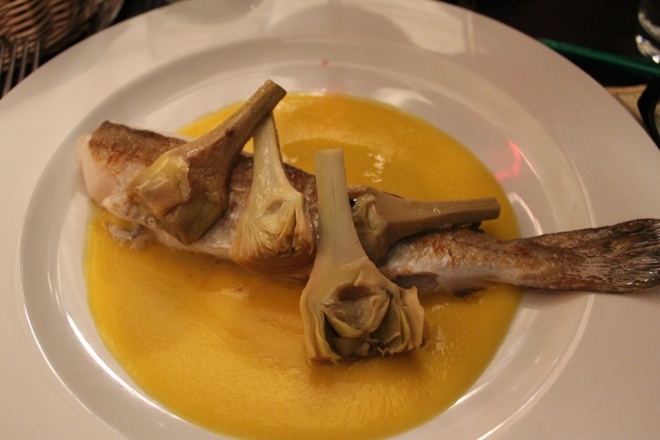 Since its reopening in 2010 after moving from the 9th Arrondissement the buzz surrounding Chef Daniel Rose’s cooking has not stopped. You must literally ring on the day, one month prior to when you want to go, to make a booking. 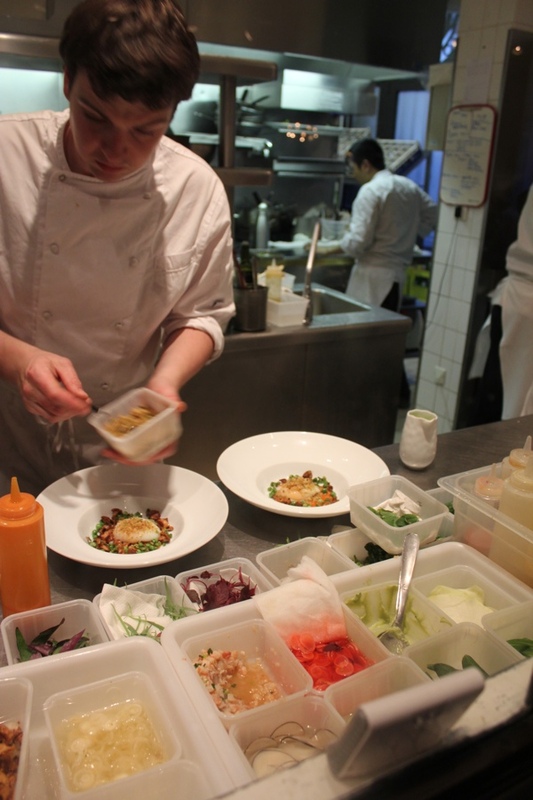 On the way to your table, you pass the open kitchen at Spring. We kept popping up during the night to check what was happening but chef Daniel Rose (on the right) had it all under control! It’s always an interesting experience when the chef decides the menu! 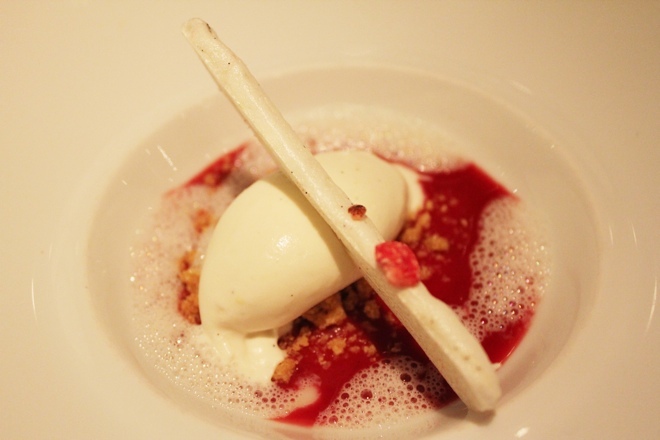 This is the case at Spring, where set menus prevail and each course is a surprise. 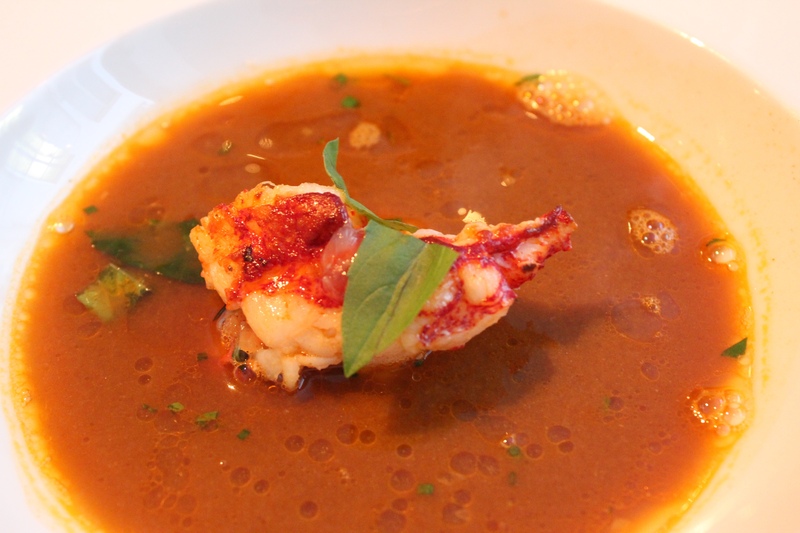 The lobster tail in fish soup starter set the bar very high. The seafood bisque had obviously been simmering for a while and had been reduced to a fabulous soup for the perfectly cooked lobster tail. 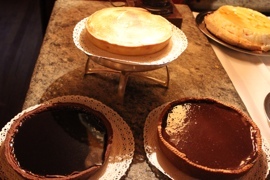 The Vegetable Torte was an unusual course but at the same time, so perfect. 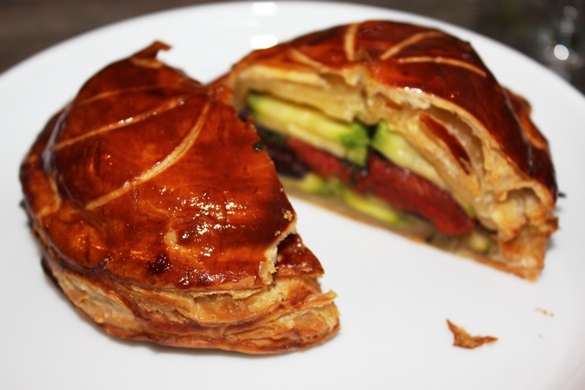 Filled with roasted tomato, capsicum, zucchini, beetroot and enclosed in a pastry case, it was a tasty surprise. Needless to say, every crumb disappeared! I wonder what the menu will be for our next visit! 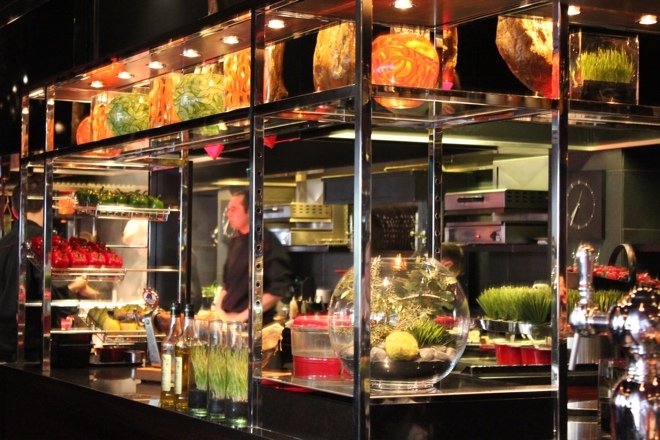 Do you like to plan your restaurants or do you prefer to ask the hotel to make a suggestion? 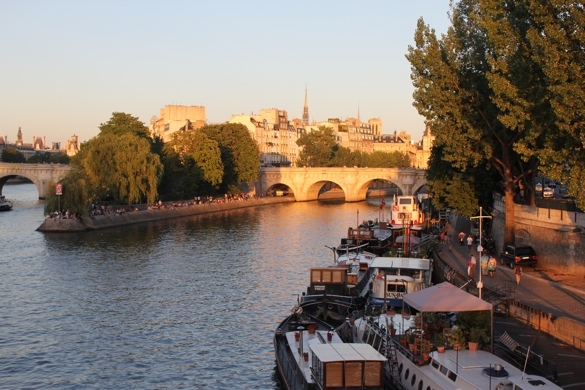 Choosing where stay in Paris is always fun. 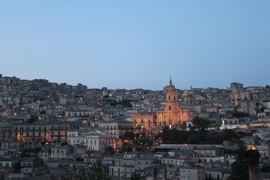 We usually stay on the Left Bank where there are many fabulous small hotels, but this time we thought we would like a change. Time to go to the other side! The Hotel Thérèse is in the 1st arrondissement, just off Rue Richelieu. 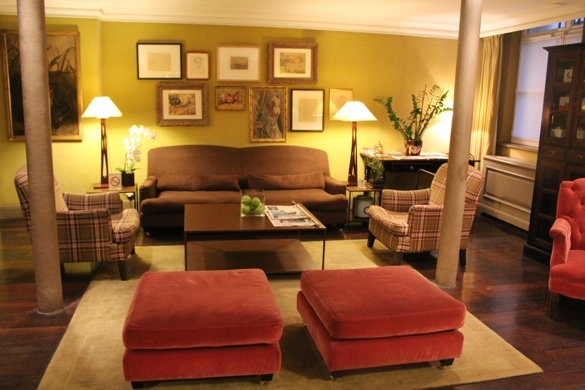 As is typical of most Paris hotels, the rooms are tiny but the hotel is charming and the staff friendly and helpful. I would recommend that if you stay here, book the deluxe room! 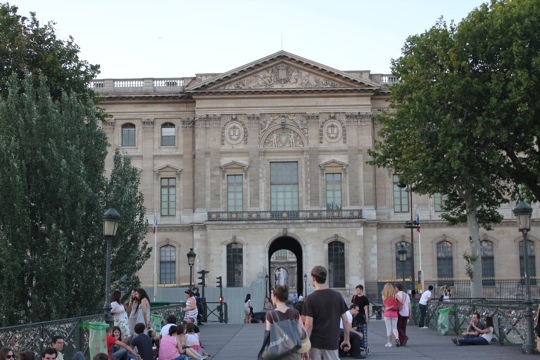 Right next door is the Palais Royal with it’s beautiful gardens and arcaded shops. At the end of Rue Thérèse is L’Avenue de L’Opéra which leads to the Opéra and on to the famous department store, Galeries Lafayette. Shopping heaven is close by! At the end of the street is Rue Saint-Honoré, lined with some of the world’s most famous shops. First stop is Colette, a fabulous shop with fashion on the first floor, boy’s toys, gadgets and trinkets on the ground floor and their famous ‘Water Bar’ in the basement. 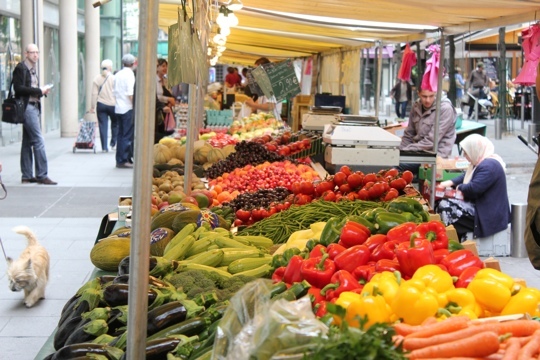 Not far from here, we make a detour into the Rue du Marché St-Honoré and find ourselves in the local food shopping street. 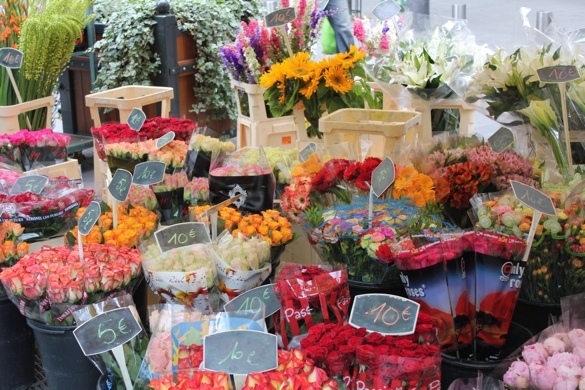 The market is in full swing. There’s some great little places in the street. 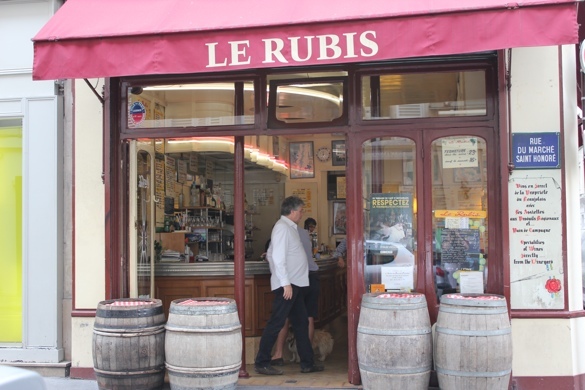 First stop is Le Rubis. 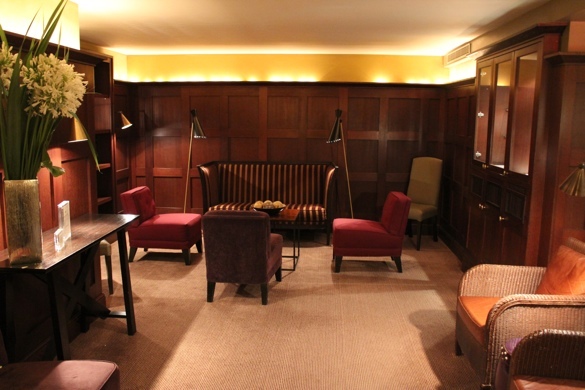 This little wine bar is a Paris institution having been here since the 30’s. 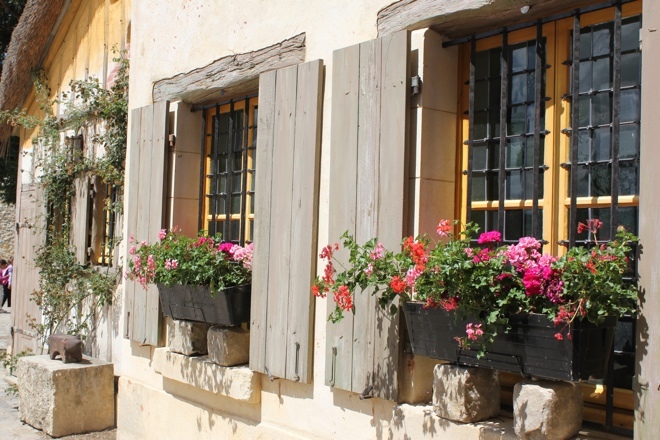 Step back in time for a wine and plate of charcuterie standing at the zinc bar or join the locals gathering around the wine barrels on the pavement. Cooking in your apartment? Try the local butcher. Mon. 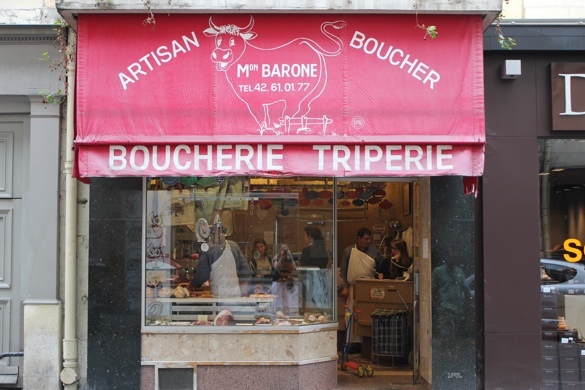 Barone the Artisan Boucher! 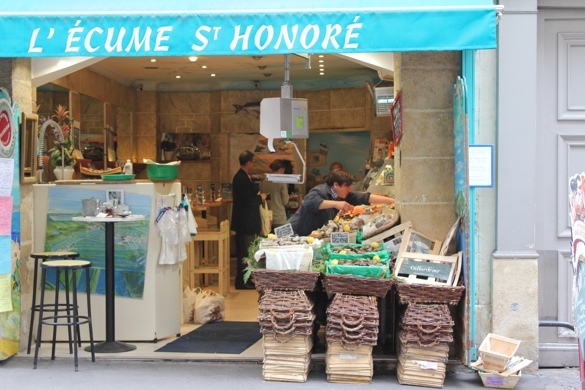 L’Écume St Honoré is amongst the best places in Paris for oysters. Sit at one of the high tables and choose from the fabulous display of oysters, scallops, crabs and lobster. They even have the sound of seagulls playing in the background! 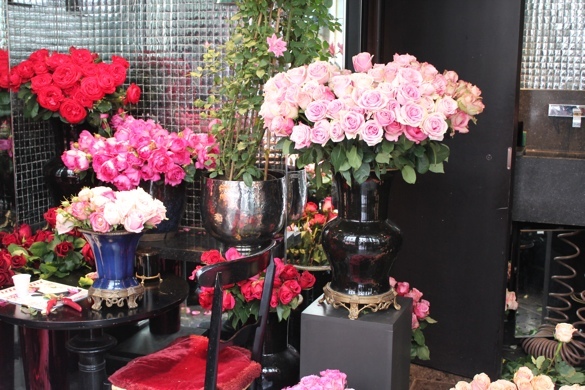 From here we walk a little further along Rue St Honoré passing the fabulous display of roses at the florist’s shop in the trendy Hotel Costes. 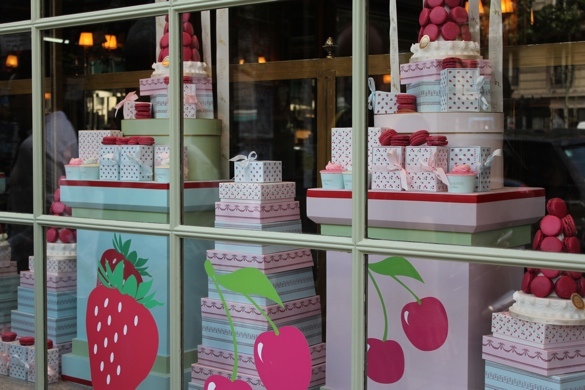 On the corner of Rue St Honoré and Rue Royale is Laduree, famous for their macarons and pastries. I resist the temptation to go inside. Thank heavens the windows are always a treat. 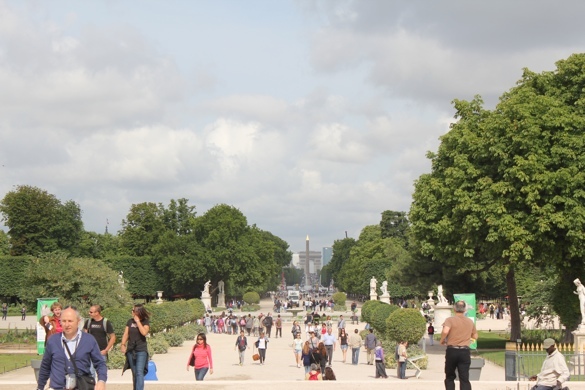 We could have continued our walk along the fabulous shops of Rue du Faubourg Saint-Honoré but instead we walked down Rue Royale to the Place de la Concorde to take a leisurely stroll home through the Tuileries Gardens. It doesn’t matter how often we walk this path, it still feels like our first visit to Paris. 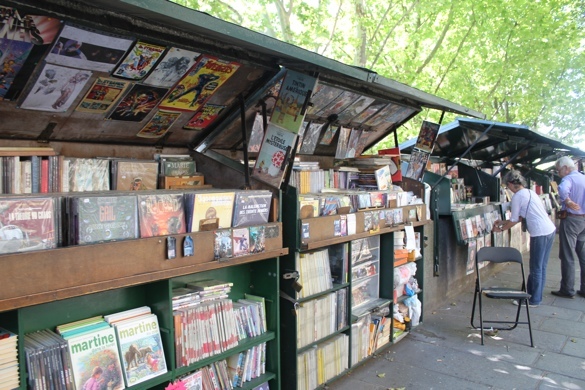 ……and walking along the bank of the Seine where booksellers line the path. Dinner that night was at Ze Kitchen Galerie on the Left Bank, so we had to cross back to the other side. 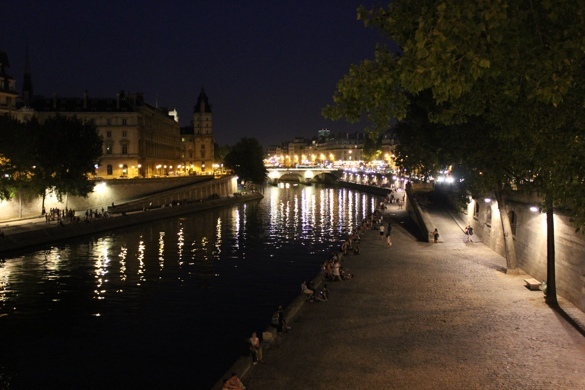 On a beautiful summer’s evening it was an easy stroll across the Pont des Arts. 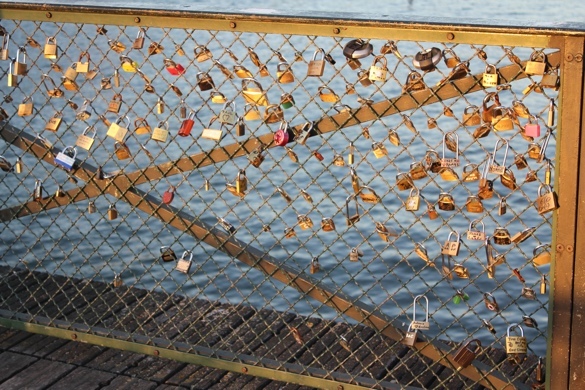 This metal pedestrian bridge is popular with lovers who attach an initialled padlock to the bridge and throw the key into the Seine as a sign of undying love. The government is not quite as romantic, claiming the padlocks are eyesores and haved removed quite a lot of them. 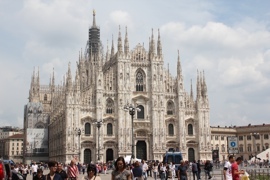 Debra from Bagni di Lucca and Beyond recently wrote about this trend that is occuring in many countries, questioning whether it is a romantic gesture or vandalism. You can read her thoughts here. 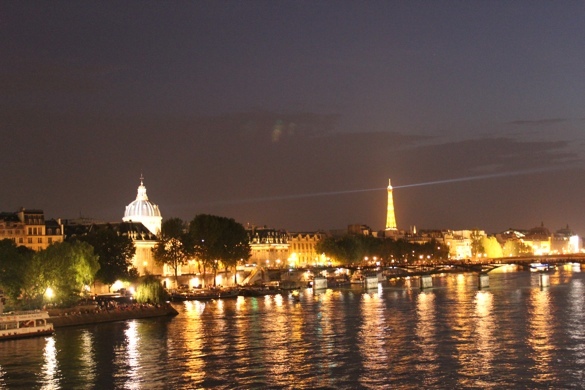 Where do you like to stay in Paris? 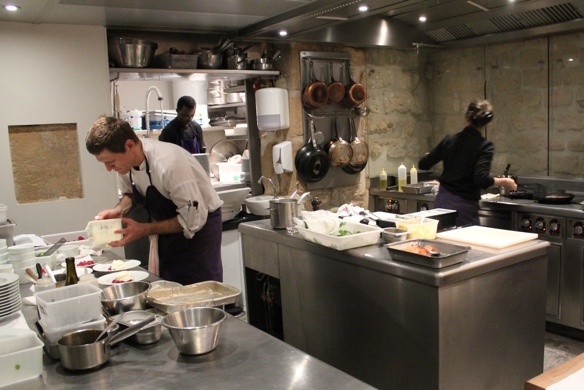 There’s something magical about sitting at the bar of a 2* Michelin restaurant in Paris and watching the chefs in action in their open kitchen. 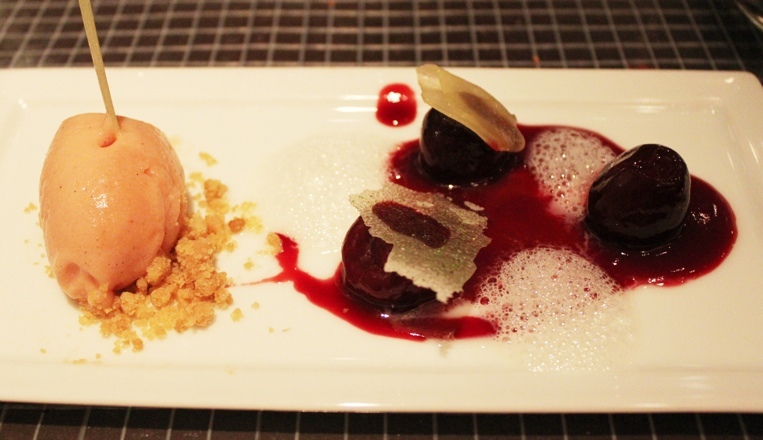 A couple of weeks ago I gave you a sneak preview of our fabulous dinner at L’Atelier de Joel Robuchon. I love eating here. 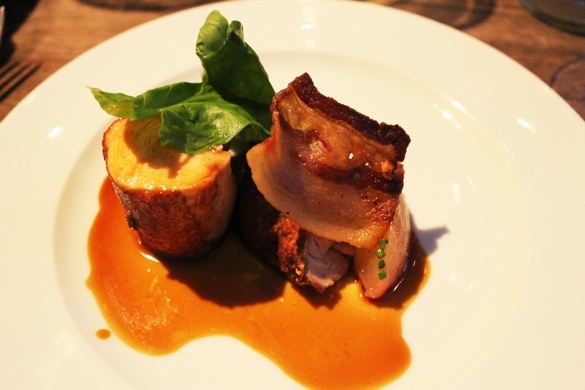 The menu is tantalising, the food outstanding. 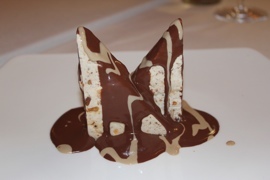 This is the reason it is listed at number 15 in San Pellegrino World’s 50 Best Restaurants. 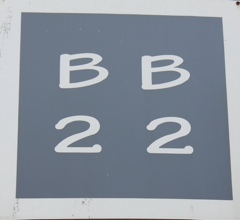 Bookings are only taken for the 12.30 lunch sitting or for a 6.30 dinner. If this doesn’t suit, you arrive and keep your fingers crossed. I’ve tried to figure out how the booking system works but I’m still confused! We were lucky on this visit. Arriving at 7pm, we were fully prepared for the “come back at 9 reply” but instead were seated. Hurray!! 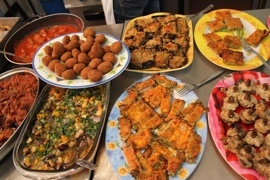 The menu features many tasting plates. 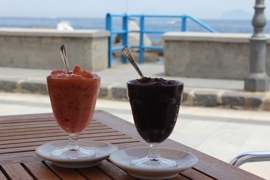 Choose a selection of these or you can order traditionally with an entree and main course. 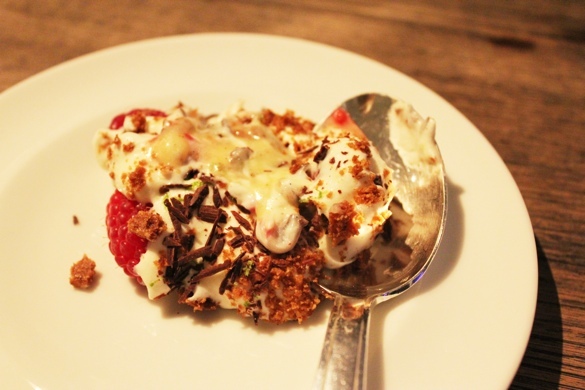 Whatever you do, leave room for dessert. 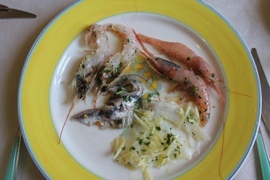 Dishes with names such as Les Anchovies, L’Oeuf, La Langoustine and Le Jambon grace the menu. Our first dish was ‘Les Tomates’, a lesson in simplicity. 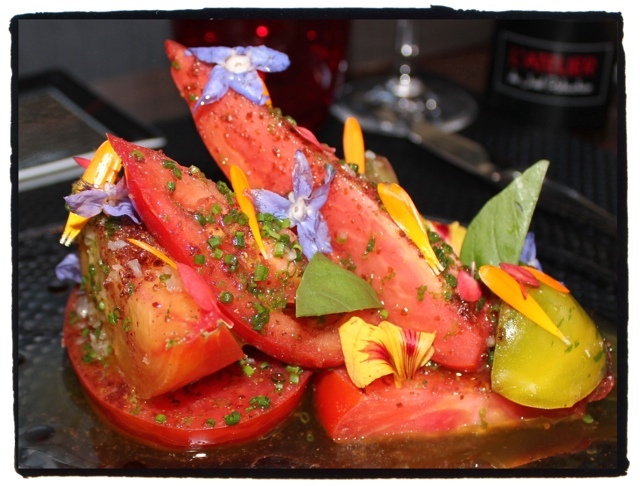 A mixture of ‘les tomates anciennes’, was served with sumac and extra virgin olive oil. This was a reminder back to the days when tomatoes tasted like tomatoes. 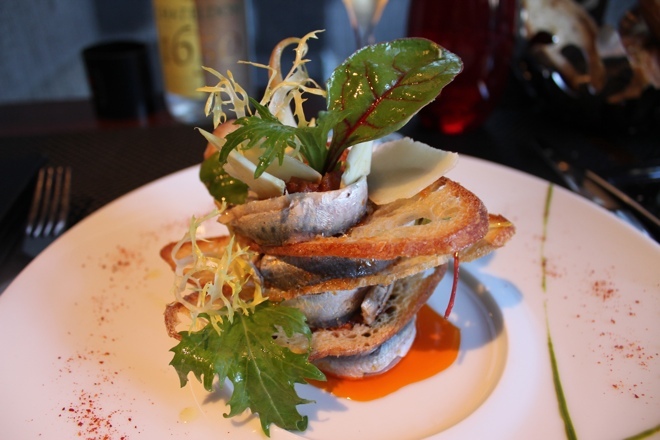 We also enjoyed ‘Les Sardine’ – a picture perfect stack of sardines layered with fine melba toast provencale. 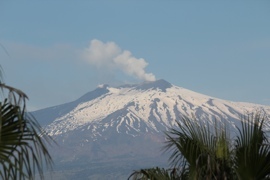 It bought back memories of our fabulous meals in Sicily. 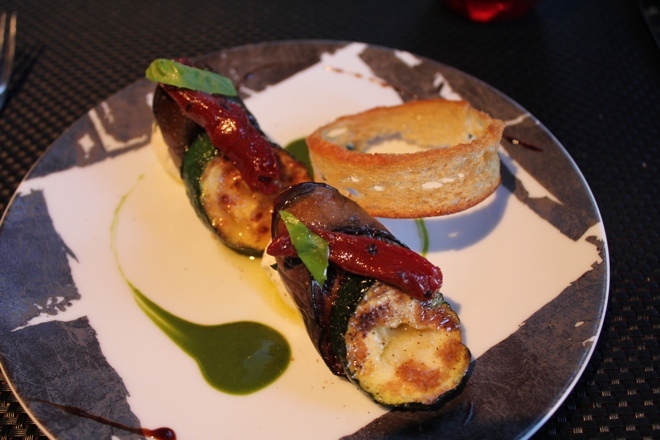 Mozzarella and basil in a mille feuille of aubergine was a french interpretation of a classic Italian dish. Beautifully presented and tasting as good as it looked. I had to try Les Girolles. 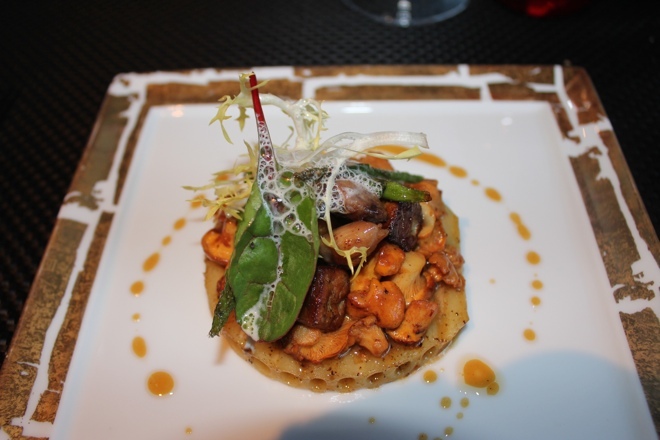 The combination of wild mushrooms cooked in milk and served with foie gras was perfect. My husband had to have his meat! 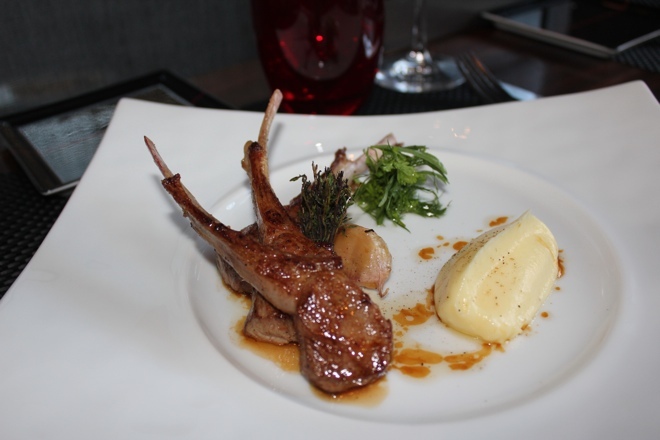 The most tender and succulent baby lamb cutlets were served with thyme flowers. He was in heaven! 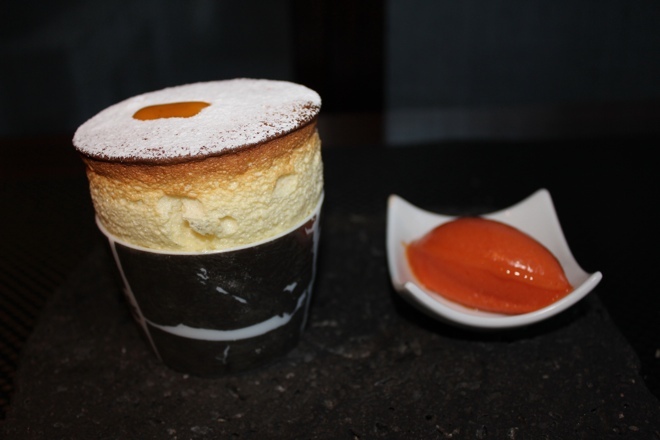 From past experiences, we knew the souffle was a must. Sensational as usual. 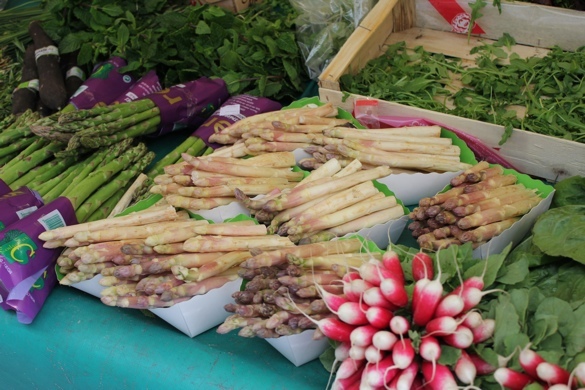 What is your favourite restaurant in Paris? 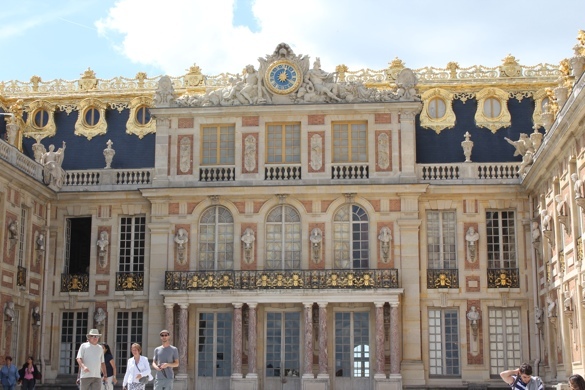 I love visiting the Palace of Versailles. 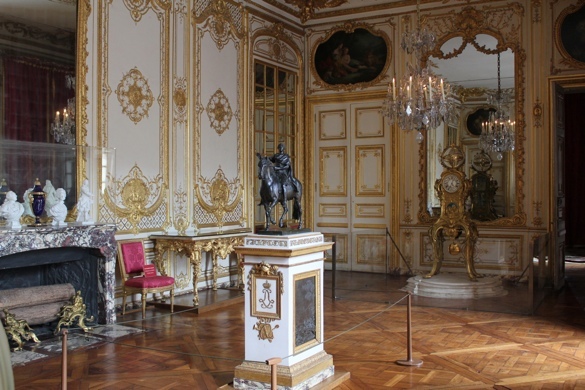 Often the crowds can be a bit daunting but there is nothing better than letting the history of the time come alive in these beautiful rooms with their over the top, opulent decororation. 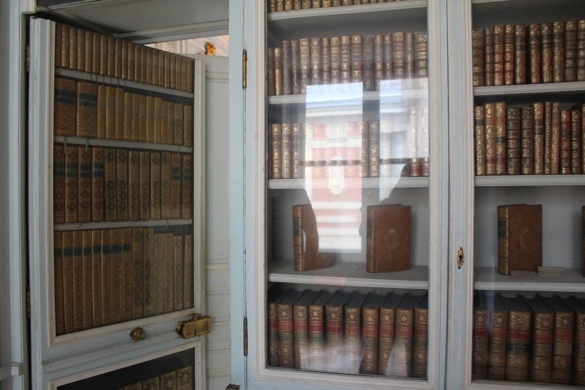 This time, we decided to go behind the scenes and visit the King’s private apartments. 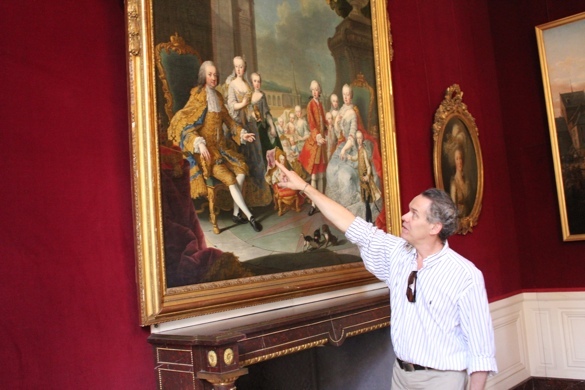 Our guide, Deborah Anthony, had excelled with her tour of the Grand Trianon and Petit Trianon as well as Marie Antoinette’s Hamlet, so we were looking forward to this visit. 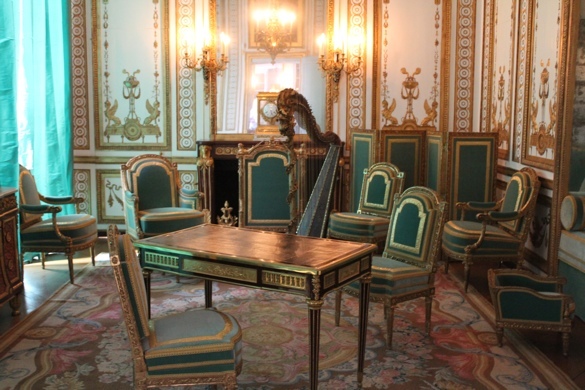 The interior court of the Palace was looking stunning. 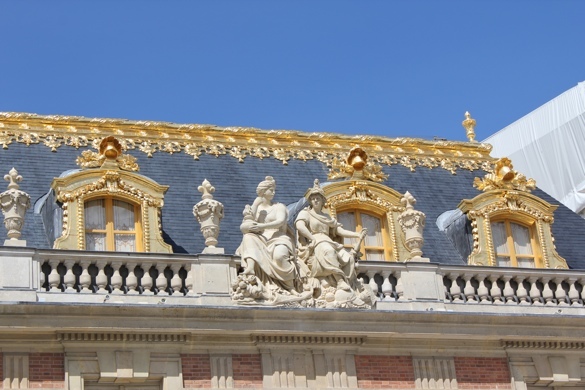 The gilt on the roof and balconies had recently been restored and everything was sparkling. 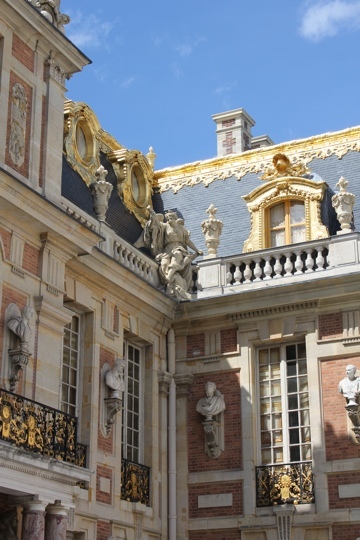 To see the private apartments, you must be accompanied by one of Versailles’s own guides as well as a security guard. Our guide, Dominic, was extremely knowledgeable. 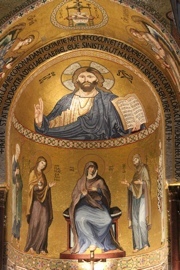 His own personal interest was in the fashion of the time, so he was often pointing little titbits out in the paintings or decorations. 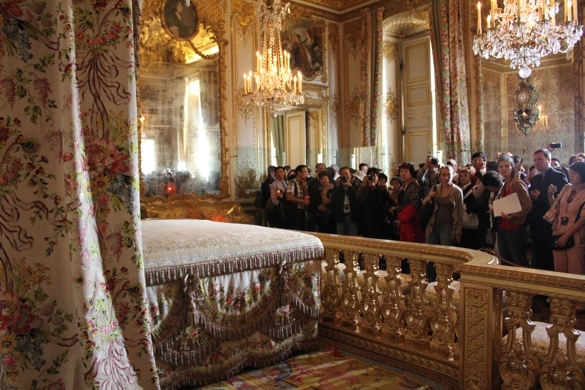 One of the interesting things he mentioned was that after the Revolution, all the furniture and works of art were sold. 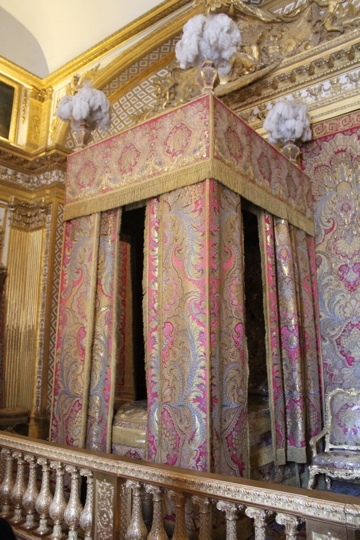 Whilst some have been returned and gifted back, a lot of the furniture and has been bought back by Versailles. 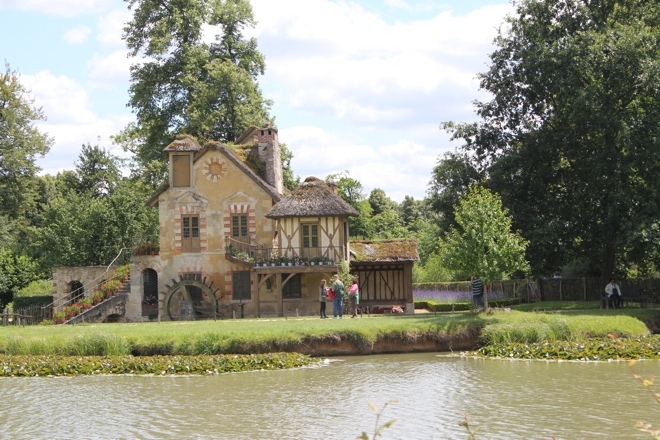 The Friends of Versailles , a group which we happily joined, raises funds for the restoration and purchase of these when they come up for sale. 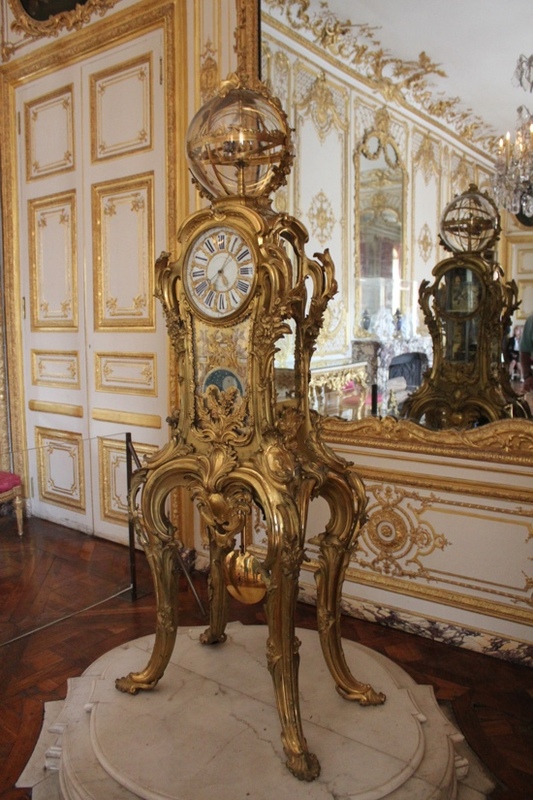 This clock belonging to Louis XV shows the time, the day of the week, the month, the year and the moon’s quarter. It has been designed to last up to 9999! 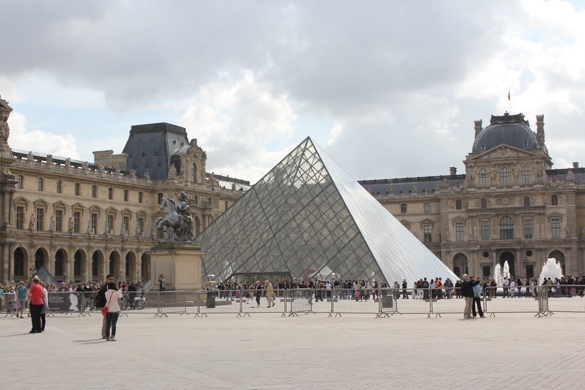 The planets can be seen revolving around the sun in the chrystal dome on top. 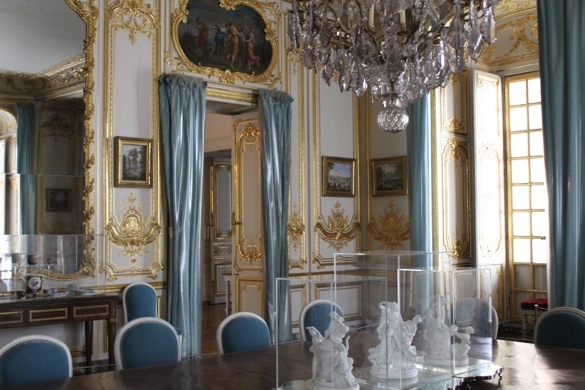 The dining room was created originally for Louis XV but used a lot by Louis XVI and Marie Antoinette for their ‘society suppers’. 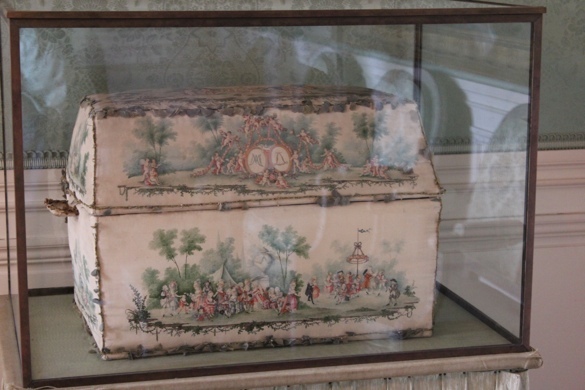 It is called the Porcelain Room not only because of the porcelain on display ( including the paintings) but because each year at Christmas, the King, who owned the Sevres factory, would use it as a showroom where the courtiers could come and buy presents. 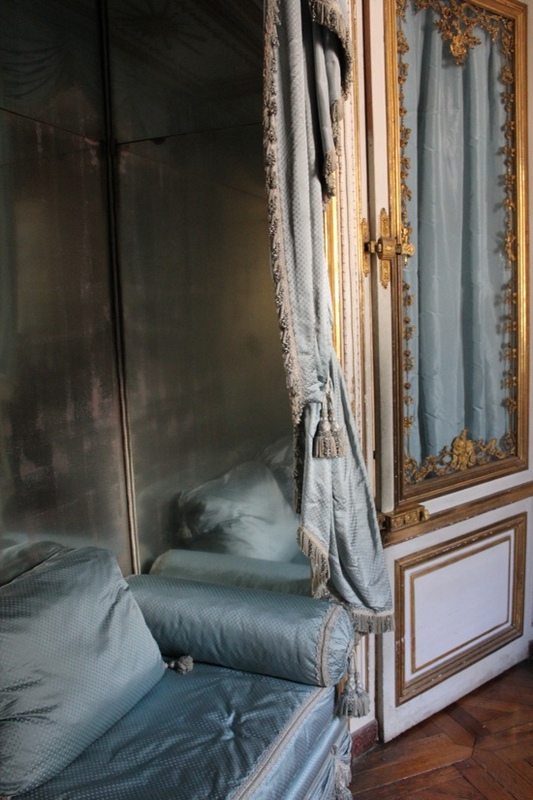 Louis XVI’s dressing room is entered from a door hidden in his bedchamber. 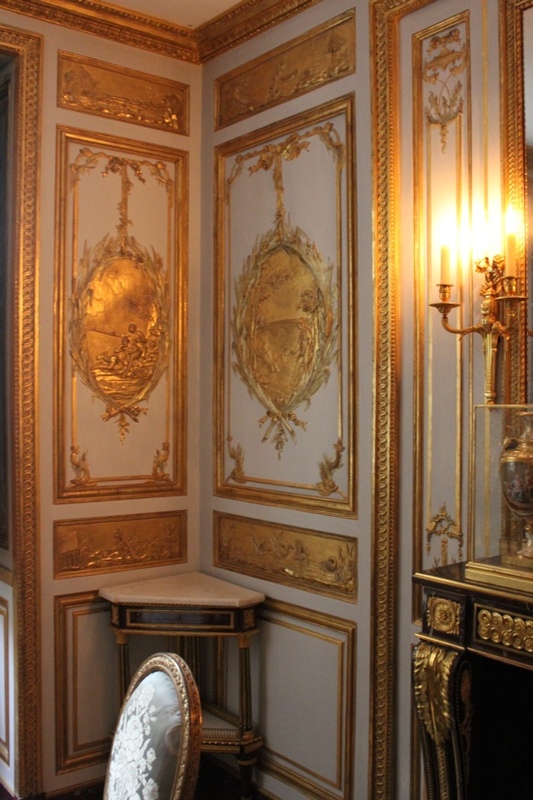 It is quite an extraordinary space lined with wood carving decorated in gilt. 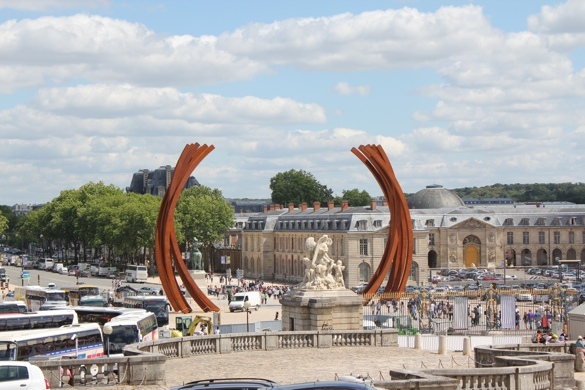 As we were saying goodbye to Dominic, I gazed at the new modern sculpture at the entrance. 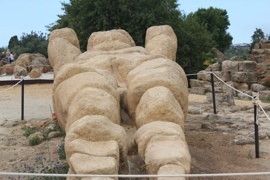 Whilst I love modern sculpture, I am not sure that this is the place for it. Finally the day had come for our long awaited dinner at Ze Kitchen Galerie. I had been wanting to eat at this one star Michelin restaurant for a while now but last minute bookings had proven difficult to obtain on our previous visits. This year, I was smarter and made the reservation before we left. 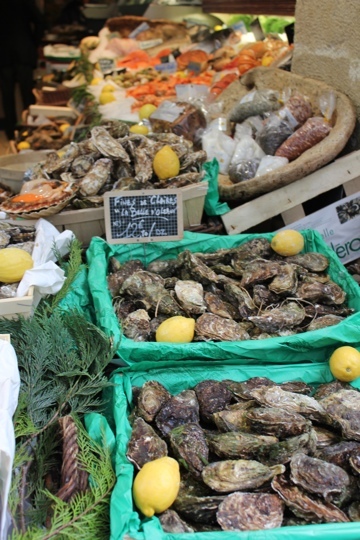 The restaurant is situated in Rue Des Grands Augustins, a small side street off Quai Grand Augustins in the 6th. 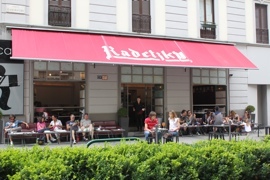 It is a popular street for restaurants. 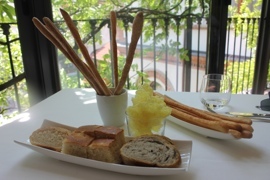 Guy Savoy’s bistrot, Les Bouquinistes is on the corner, Ze Kitchen Galerie’s bistrot, KGB (Kitchen Galerie Bis) is down the street and the one star restaurant, Jaques Cagna is on the next corner. 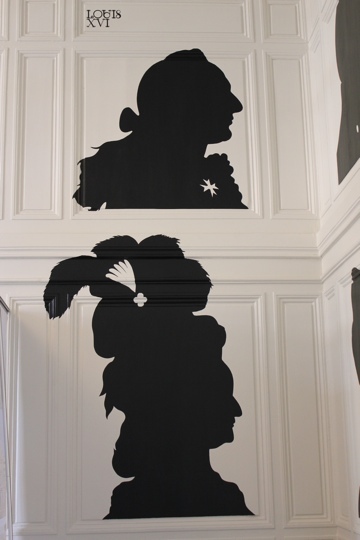 The fabulous tea salon, Mariage Frères is over the road. 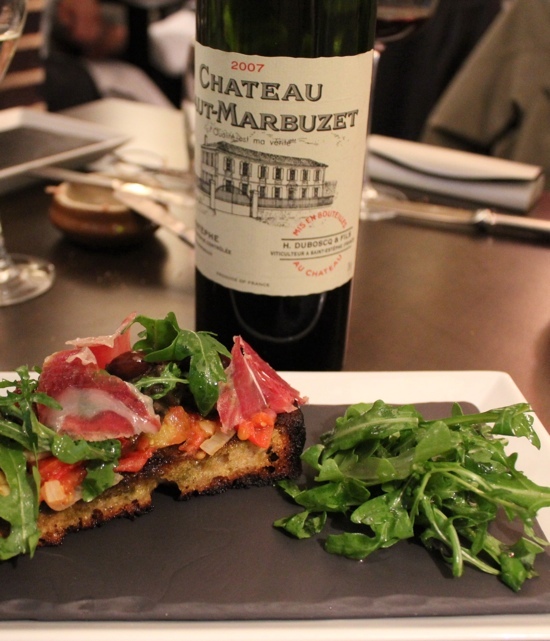 Ze Galerie Kitchen is an intimate restaurant with an open kitchen at one end. It is also a gallery with exhibitions of modern art displayed on the walls. The service is friendly and impeccable. 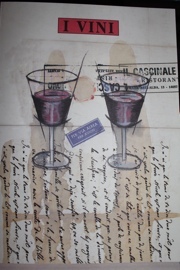 We didn’t have to wait long for a glass of champagne to be bought to us as we perused the menu. Everything sounded delicious. I wanted to try it all, so we ordered the tasting menu, though I did have one small request. I was desperate to try the tempura crab with crab filled zucchini flowers and calamari strips but it was not on the tasting menu. 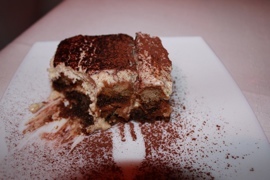 However our gorgous (and good looking) waiter said it was no trouble for it to be included. Out went the beef and in came the crab. Easy. 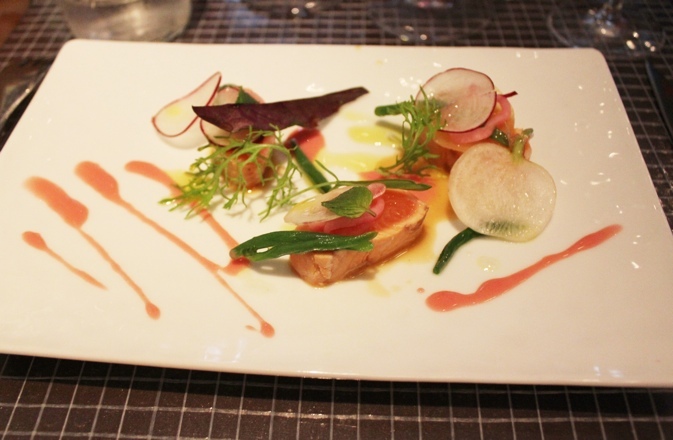 We started with an ever so lightly, pan cooked salmon with sweet potato jus and radish. The addition of the radish was interesting and worked perfectly with the salmon. 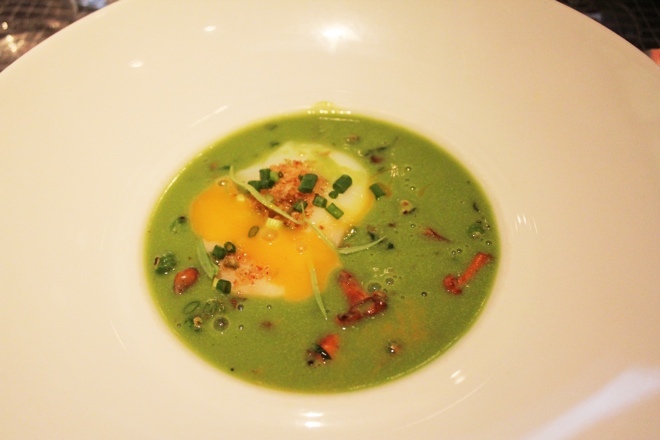 Our next dish was an delicious combination of a slightly cooked egg floating in a pea soup with peas, girolles and wasabi. I popped up to the kitchen to watch the chef making this dish. 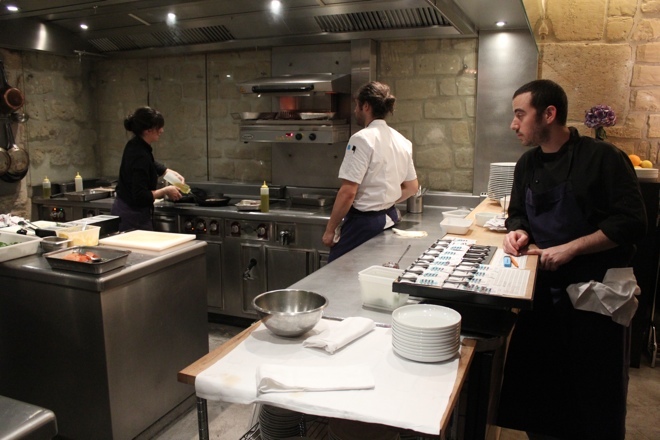 The kitchen is actually quite small and, with twelve chefs working shoulder to shoulder, it was amazing to watch. 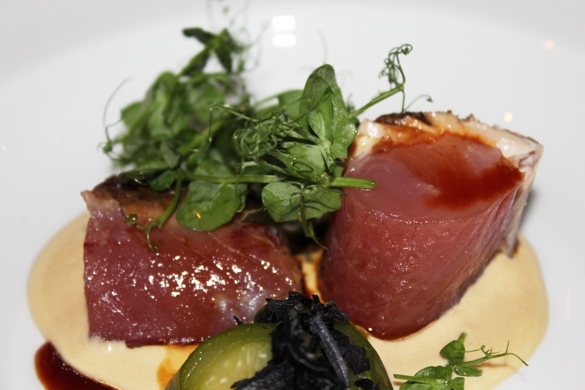 Each chef was responsible for one or two courses and had everything they required for their dish ready at their fingertips. Another salmon dish followed. 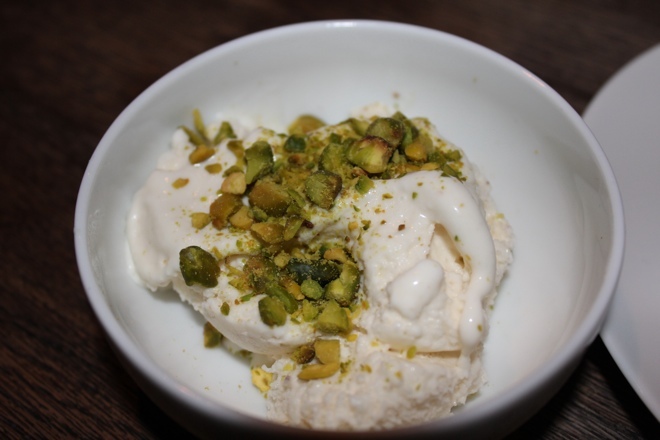 This was in a completely different style to the first course. 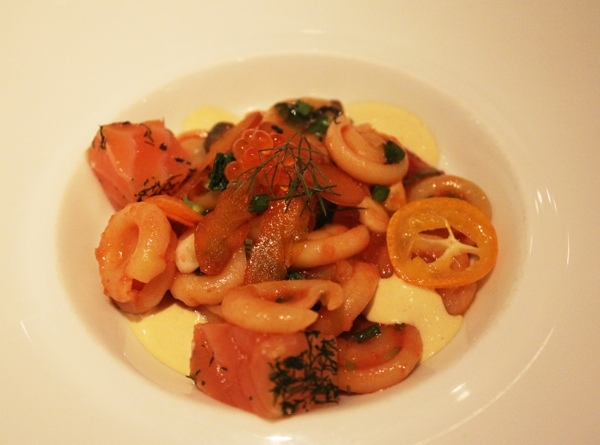 It included cappelletti pasta, fresh tomato sauce and bottarga eggs with the salmon. At last the course I had requested arrived. 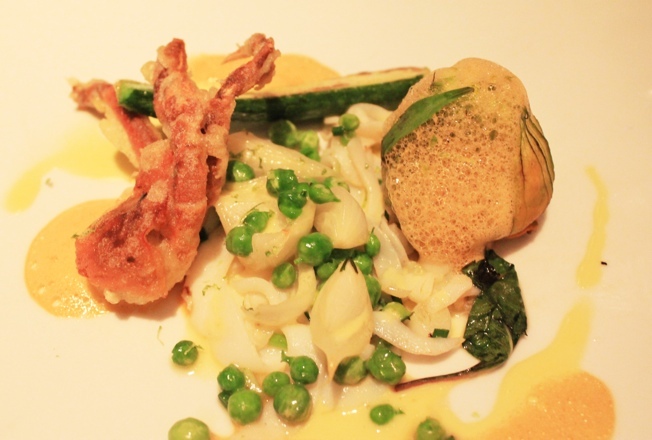 The delicate flavour of the crab filled zucchini flowers contrasted with the crispiness of the tempura crab, with the calamari adding yet another dimension to it all. So tasty! This was followed by a dish of veal and sweetbreads with turnips and carrots. I’m not usually a sweetbread fan but these were very tasty and perfect with the tender veal. The only trouble was that I started eating and forgot to take the photo! 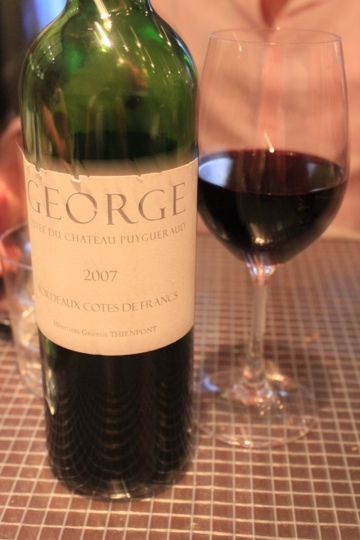 A fabulous finale to one of our best meals in Paris. Can I book now for next year? 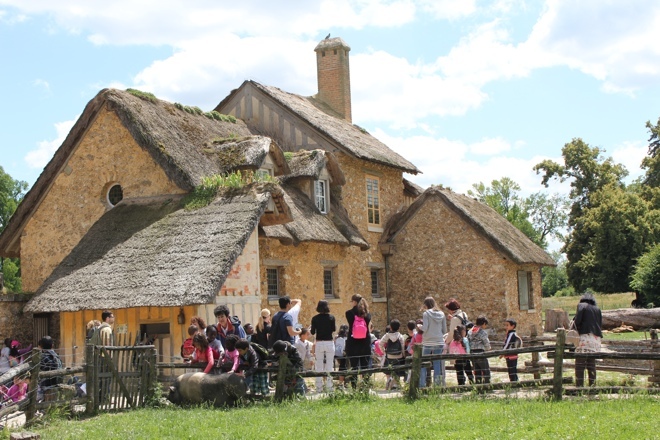 The Queen’s Hamlet, Marie Antoinette’s quaint little village and farm which is also known as the L’Hameau de la Reine, is one of the highlights of Versailles. 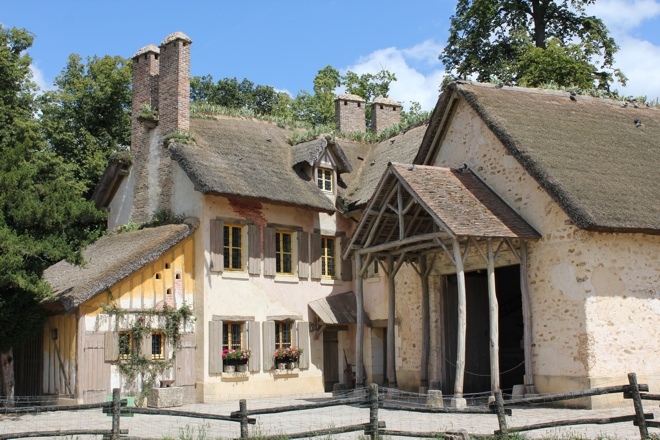 The hamlet was created in the style of a minature Norman village. 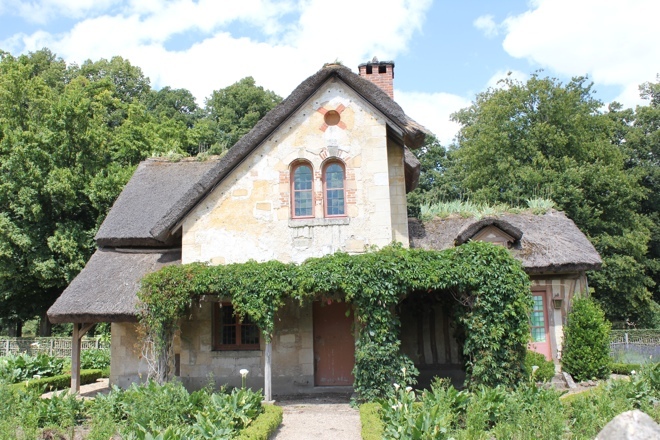 It contained the farm, twelve thatched cottages, a dovecote, mill and tower, all of which Marie Antoinette had built in 1783 by her favourite architect, Richard Mique and landscape gardener, Andre Le Notre. 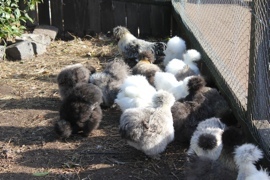 She loved the simplicity of country life and wanted to indulge in it. 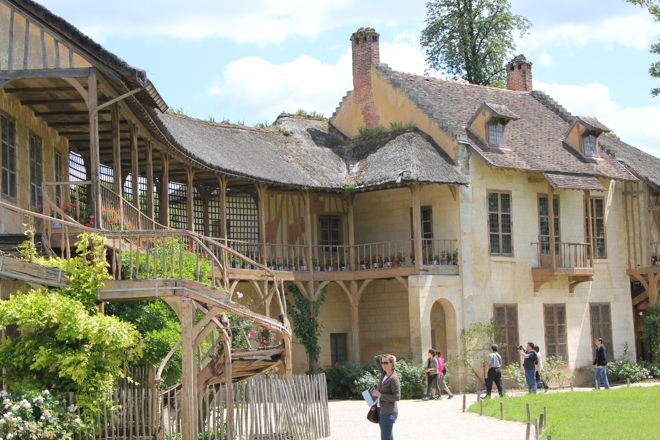 She also wanted the farm to help create the illusion that the Petit Trianon was in the countryside. 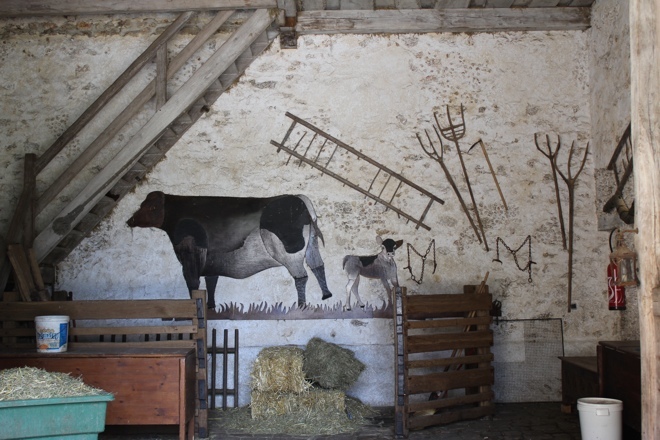 As you walk through the gate, you do feel as though you are in the country. 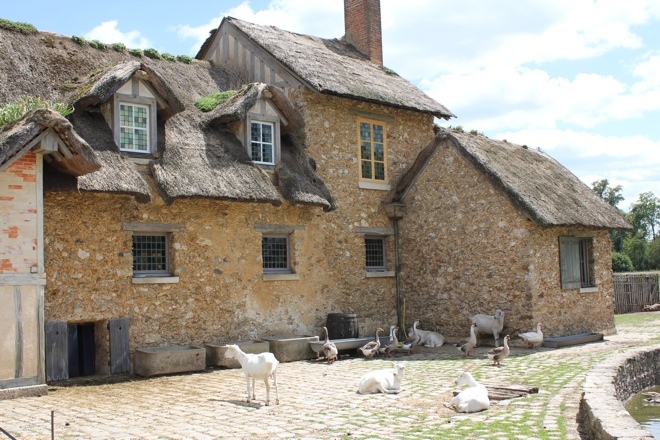 Goats, ducks and geese roam the grounds around the buildings whilst children gather to pet the pigs in the sty. 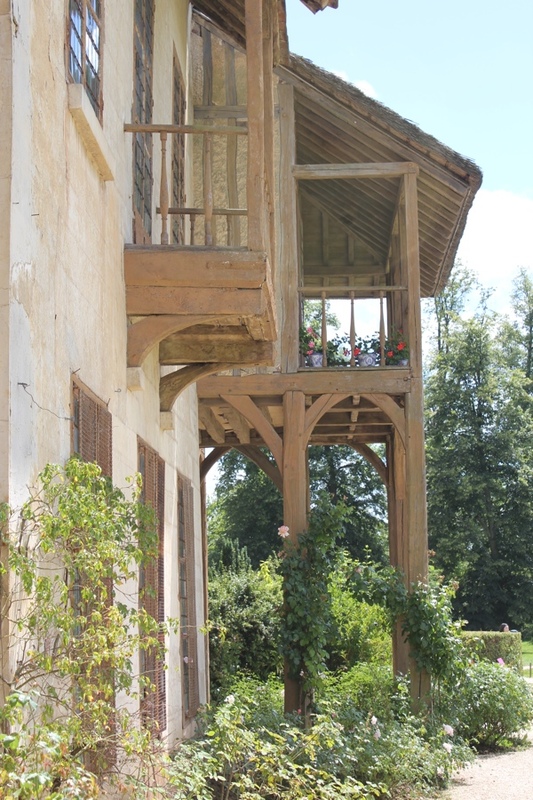 The buildings are beautiful in a rustic way. Left to disrepair after the revolution, they were thankfully restored in the late 1990’s. 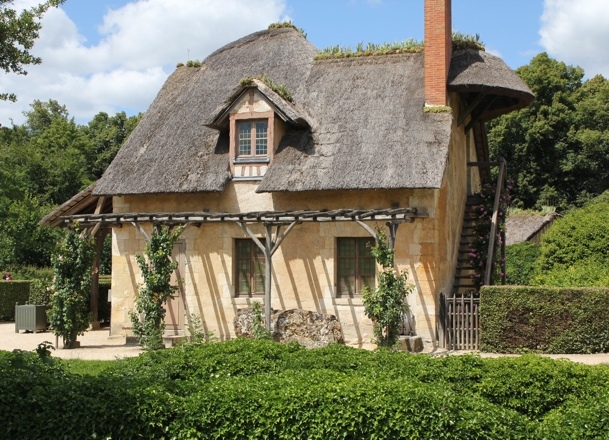 They all have a thatched roof complete with grasses growing from them and flowering window boxes. 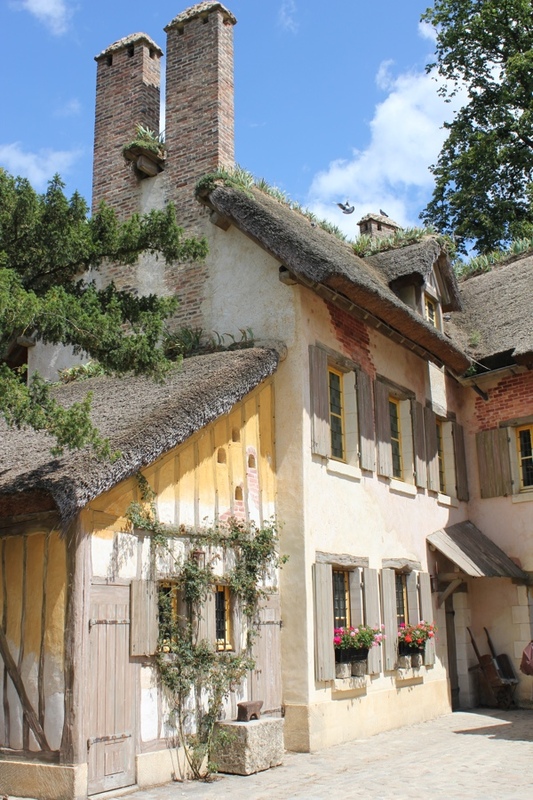 Marie Antoinette and her companions often collected the eggs and milked the cows here. 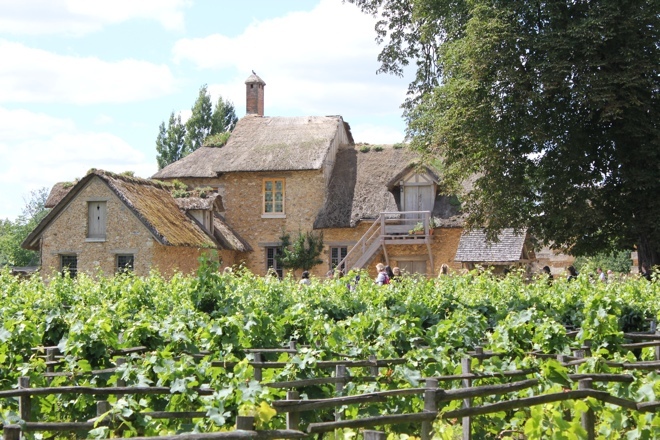 A farmer was appointed by Marie Antoinette to manage the farm, so that it’s vegetable gardens, fields, orchards and vineyards supplied produce to the palace kitchens. 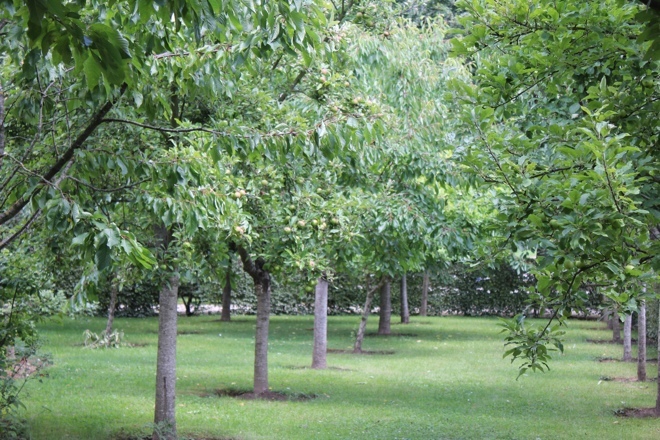 You pass these on your short walk to the lake and village houses. 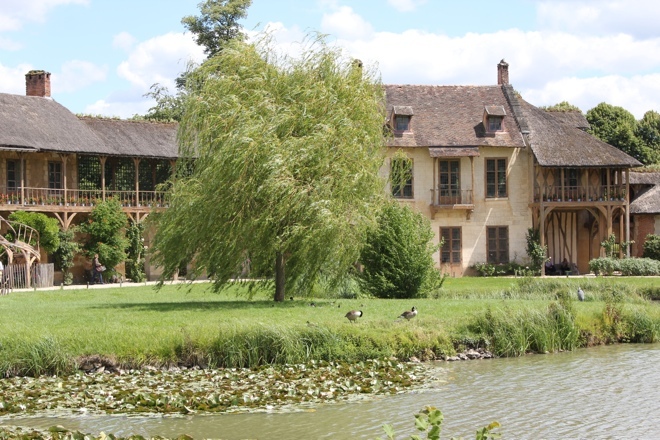 The largest house is the “Queen’s House” at the center of the village, overlooking the lake. 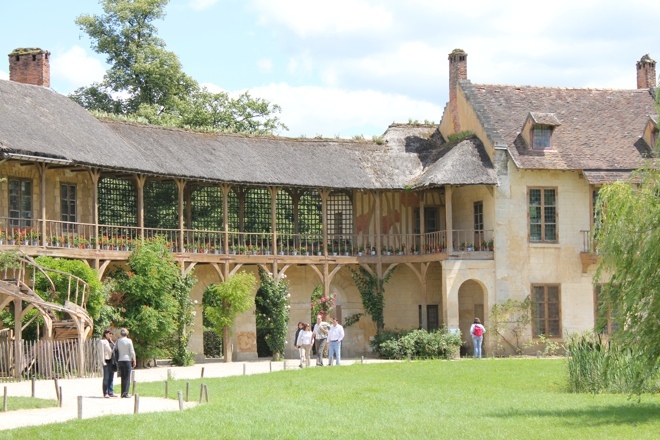 It is actually two buildings joined by a wooden gallery where, we are told, Marie Antoinette, dressed in white muslin, would watch over the workers. 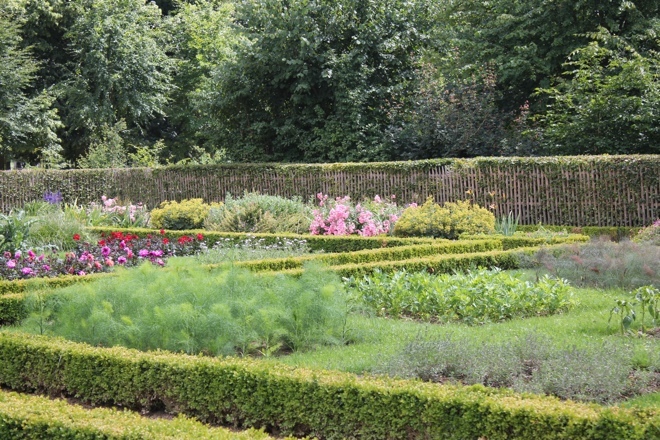 Most of the houses in the village had their own vegetable garden surrounded by hedges. The Marlborough Tower, next to the lake, was used as the starting point for boat rides as well as an observatory. 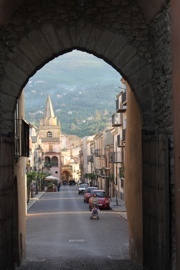 This truly is a fairytale village. 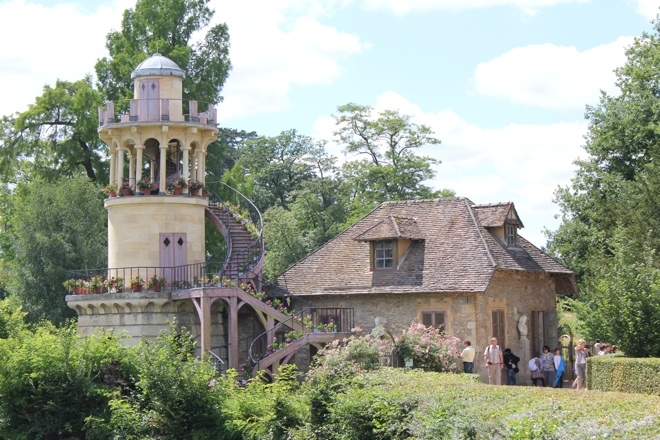 I can’t wait to come back for another visit, maybe with a picnic lunch, and spend time surrounded by the intriguing history of Marie Antoinette’s playground. 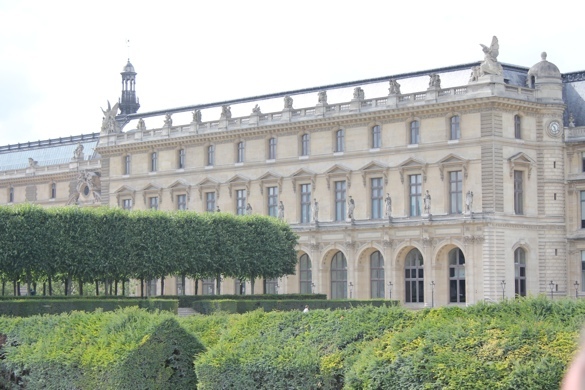 Have you found this special corner of Versailles? 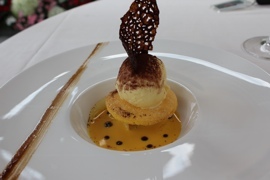 A sneak preview of my fabulous dinner at L’ Atelier de Joel Robuchon in Paris. 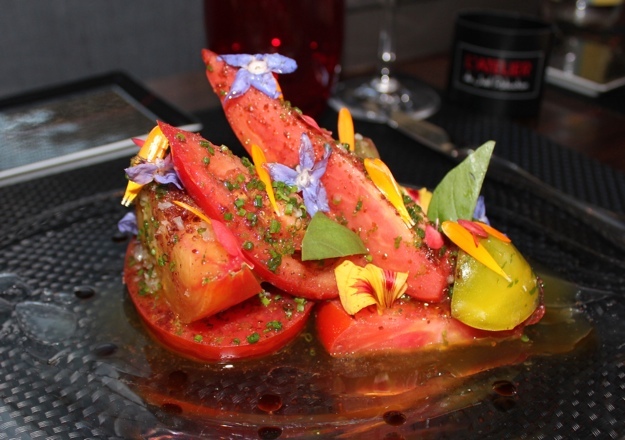 The dish is ‘Les Tomates’, a simple but stunning dish of different types of tomatoes dressed with sumac and extra virgin olive oil. Tomatoes as you don’t often taste them- incredibly flavoursome. 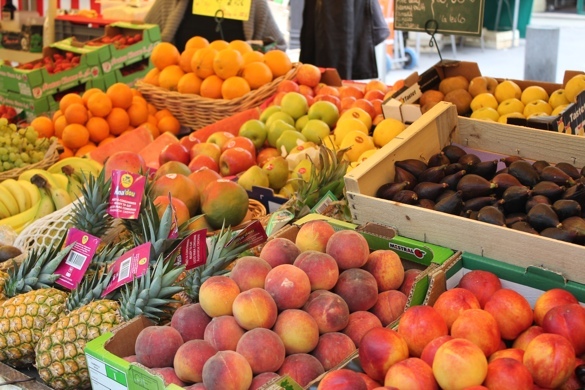 If your produce is the best, nothing else is required.